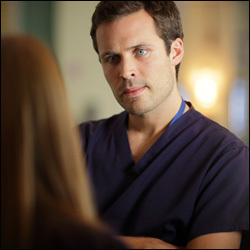 Michael returns to Holby for his disciplinary hearing, but when Sahira and Jac are called on to testify, there’s no telling what his fate will be. Michael and Ric lock horns once more over a patient in desperate need of Michael’s expertise. Can Michael step up and save the day or will this prove to be one trial too many? Jac spots an opportunity to capitalize on Michael’s mistakes, and tries everything she can to distance herself from the plastics fiasco. When Jac misses out on a career enhancing procedure, she tries to convince Ollie to join forces on a new research project, but when he discovers the truth about her involvement in the plastics scandal, he has a few requests of his own. When Dan pressures Chrissie to make decisions about the seating plan for their wedding, she loses her temper. When he asks her to make a decision about their first song, she is even more affronted and threatens to call off the wedding, leaving Dan to figure out what’s really important to his bride to be.